In the war of Humans and Orcs that occured long ago many Orcish warriors were corrupted by demonic influence and became tools of blackest darkness. One such warrior was the leader of the Half-Tribe of the Bloodied Axe Clan; Mogul Kahn. Mogul was slain by human Paladins but mysteriously was seen fighting alongside the Scourge around the time Mannoroth started to command the Orcs in the war against Archimonde. The Axe has been revived by demons and uses his reflexes and powerful blows to hunt down and seek out the Sentinels' agile warriors and cut them down to size, even projecting his lust for war onto them. Instant killer due to the ultimate skills. Can make good entrance on war. Doesn't have stun skill's, its rarely for STR heroes. His movement speed is to low. 1. Berseker Call :Mogul Kahn focuses all of his enemies' hatred on him, causing them to attack him at all costs. NB: Spell Immunity and invisible enemy is affected. 2.Battlehunger : Afflicts a target with a terrible killing hunger. The target will take damage per second until it kills a unit. NB: DPS and can make slow too. Enemy can stopped the effect of this skill after killing creep or tower. NB: This skill have 17% chance after enemy's hero or creeps hitted on you to activated. Very usefull on early game. You can block enemy creeps with your body. 4. Culling Blade(shortkey = C). Purges the weak from Mogul Kahn's sight. Deals moderate damage, but will kill a target that is low on life. NB: You can do Instant kill for enemy which have HP under 300,450,600. Aganim is stuck on this skill. Casting range = 150. NB : You can buy Ghost Staff if it necessary. 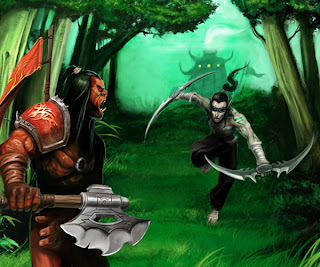 -Pick Axe if you are newbie on dota or your team need tanker. -Don't pick axe if your team need carry or you are pros on dota. Never do solo lane. bottom or up lane is best for axe. You can block enemies creep on middle of first tower and second tower's enemy. But do this is your enemy isn't INT. Best use if your enemy is melee(except raigor or another hero which have many active skill). This is why axe can't become carry. In early game, if you do like the above, you will be rich. Buy the core items. And after that, you must see on the condition, if you think you can saving your gold until buy Daggers, than do that. If not, you can buy Phase Boot's first. I think your "Counter Helix" doesn't give you much advantage now. Blade Mail is the best choice for Mid game. Dagger, Berseker Call, click on Blade Mail, wait 3-5 second and hear "Triple Kill" on your audio XD. You are tanker, so your job is initiator.